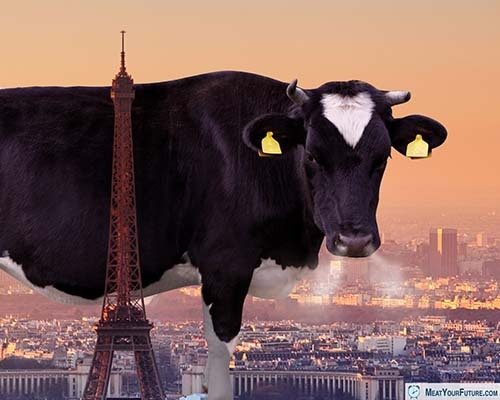 The Paris COP21 Climate Change Conference completely missed the "Cow In The Room"
The United Nations has determined that animal agriculture is responsible for more greenhouse gas emissions than all of the transportation sector combined. As the new report from the independent policy institute, Chatham House, explains, without addressing meat consumption, it will be near impossible to keep global warming below the “danger level” of 2 degrees Celsius. Another major driver is our unprecedented human population growth, which went from 1 billion in the 1800s to over 7 billion today. We can’t reduce our overall carbon “footprint” if we keep adding more and more “feet” at an exponential rate. Yet none of the commitments submitted to the Paris COP21 include reducing meat consumption, nor reducing the population growth rate. Political concern over the backlash from voters for addressing culturally sensitive matters related to diet and reproduction seems to result in these important issues being given no policy priority. What will it take for us, as a society, to wake up and make the needed changes before it’s too late. Is Dairy Good for your Bones?